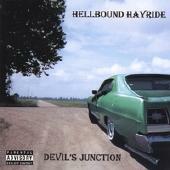 Meshing rockabilly, outlaw country and swing, the troupe which comprise Hellbound Hayride come back with their first studio album in seven years with "Devil's Junction." Unleashing the kind of whiskey-soaked, blues-based boogie you'd expect from hard-living acts like Hank Williams, Johnny Cash, and Social Distortion, cuts like "She's My Baby" rock out on the greaser tip while the subtle surf guitar sound found on "Mambo" will get you to the sock-hop just in time and the harmonica-tinged "Fortune and Fame" will keep your toes tapping and soul screaming. If you like your punk rock with a straw in its mouth and a vast array of tales from the hard side, then this is an album you need to take with you on the open road. Hellbound Hayride: Eddie Wilson - Vocals; Luis Ramos - Guitar; Mike Castellano - Bass; Carlos Nieto - Drums. For more information, check out http://www.myspace.com/hellboundhayride.